The first phase is the #3, #4, and #5 hybrids. If you haven't hit a hybrid yet, man, oh man, have I got a treat for you. These clubs will become the favorite ones in your bags. They feel and look similar to woods but are much easier to hit. Just swing easy like you have an 8 or a 9 iron in your hand and you will see what I'm talking about it. The second phase is the #6 and #7. These are cavity back irons with perimeter weighting and a hollow core. The big oversized heads have large sweet spots that will give you a little more trust that you will make contact. The third phase is the #8, #9 and PW. They are built with a deep cavity, similar to the 6 and 7. The cavity back helps make miss hits still go towards the target. For the money, this isn't a bad starter set. 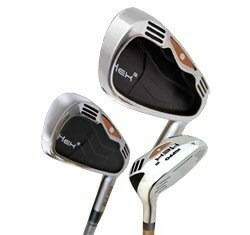 I think these irons would be good for somebody just starting out, or a golfer that has been struggling and hasn't updated to any new technology in several years. However, for game-improving irons, my two favorites are the Adams Idea A7 OS Hybrid Iron Set and the Wilson Staff D-FY Combo 8-Piece Iron Set. Both of these sets may cost you a little more money, but I think you will use them longer than the Hippos.